MacLaren's of Greenwich P. E. I.
who sailed the "Falmouth" from Greenock, Scotland in 1770. It began for me with the discovery of the "Falmouth" ship article wherein it stated DUNCAN MACLAREN was born circa 1730 in the Perthshire area of Scotland. No exact point of origin but many Falmouth passengers were from Muthill and Crieff and were neighbors or connected either through the local Church of Scotland or Rev. Barlas's Anti-Burgher seccession church, a spin off from the Presbyterian Church. This dramatically changed my initial research which was wrongly focused on a Duncan MacLaren being involved with the Jacobite cause at Bloody Culloden in 1745. Crieff and Muthill seemed quite unequivocal in their hatred of the Jacobite cause. This Duncan MacLaren was described in sasines as "in but not of" the area but a cousin german, who succeeded his kin, the Senior John MacLaren of Western Invernenty. He was called "Baron Stob-Chon"from the hill lying behind his land. According to Scottish custom, being "in but not of," meant the person actually lived there although not owning property at that stage. Coincidentally, John MacLaren was the clansman leader and spokesman in disputes and made the formal visit to "MacGregor" out of common respect. John MacLaren was scapegoated for Rob Roy MacGregor's death, shot in the back in cold blood, by a son of Gregor. The crime demonstrates John MacLaren's standing was recognized even outside the clan! If there was a system of clan hierarchy in operation, John MacLaren was the likely candidate for Chief! He may have had second thoughts, as may be expected, for in those dreadful day's, leading up to the Clearances, the title Chief was more a burden than a blessing. The mere mention of the word could bring repercussions from both Scotsmen and Englishmen alike. "Lands had been disponed to Duncan McLaren by John MacLaren in a Disposition dated 14 May 1736, written by Thomas Ripas, notary public. This Disposition was also presented, although its contents weren't recorded in the Register. Duncan McLaren was to pay the Duke of Atholl L82/13/4d at Martinmas annually. He was then given sasine and the event was witnessed by John McLaren and Malcolm McLaren in Innernenty. Interestingly, in Margaret MacLaren's, "The MacLaren's, A History of Clan Labhran" she mentions that on July 8th, 1743, Donald MacLaren of East Invernenty and Duncan of West Invernenty together gave a bond for #1300 Scots to Alexander Campbell of Corriecarnaig (Clan Campbell II, p.39). This doesn't prove they were necessarily drovers, but obviously closely related. Margaret's only statement with regards to Duncan was that he had only one child, a daughter, but any reasonable man might question if it's completely accurate, notwithstanding she's the grandmother of the current Chief? I found a Duncan McLaren of Edinburgh, married to Jean Armstrong, with a daughter Jean b.1751! I assumed he was our Duncan who sailed to PEI. After searching the OPR found he was a coppersmith in Edinburgh who died intestate on 4 April1752 with his testament recorded 1 June 1752 Edinburgh Commissary Court (CC8/8/114/1). His executor dative was his widow, Jean Armstrong, Cautioner for her was William Armstrong, coppersmith burgess of Edinburgh. Someone should follow up the Inhibition and Adjudication in the coppersmith's final sasine re: his debts, and attempt to build a family tree with children's names, hopefully a Duncan and a John, might appear! Since only Jean's name appears on the Falmouth record possibly a BROTHER, a good sized lad named Duncan was mistaken as the father. This would fit in with the story of the young bachelor, Duncan of Blantyre! We may never know if the coppersmith had anything to do with Balquidder or PEI except for the possibility a son Duncan, whom I'm quessing was the young bachelor in the story, Duncan of Blantyre! In searching PEI Archives I found "The Sketch Book," written by John MacKinnon (1915), p.162-167. There's an article called Courtship and Marriage Long Ago, an account of the courtship and eventual marriage of Catherine MacEwen of Morell to a Duncan MacLaren of Blantyre, who was said to be the most desirable youth in Blantyre. There's a subtle remark made over a previous tragedy or death, perhaps Duncan the immigrant was not a husband, instead a brother to Jean MacLaren! This would fit the Duncan of Blantyre story since that had to infer the matchmaker Norman Bain had to fill the natural place of a missing father in negotiating the marriage of the new bride's family! According to the Island Register the Falmouth set sail from Greenock, Scotland to St. John's Island (now PEI) on April 8, 1770, arriving at St. Peter's Bay on June 1, 1770. The Passenger List of the Falmouth indicates Duncan MacLaren? and unknown wife and several other children were presumed to be passengers, only one daughter, Jean, was identified with any degree of certainty. It was recorded there was mail waiting for Duncan at the Halifax Post Office, unfortunately it's never been found and we'll never know if it was picked up. Perhaps this was letters from the Court! A Duncan was alive and thought to be on the Island as late as 1775, after which there is no record, however the news blackout caused by the Revolution in the American colonies was probably part of the reason. To assume Duncan died or left the Island before April 1798, along with sons and daughters doesn't make sense, it's more than likely the family remained on PEI. At such a volatile time in world history it would also have been irrational to return to Scotland. There's little doubt about it, when their inevitable times came, they must have been peacefully but uneventfully, laid to rest somewhere in King's or Queen's County. They came to the country on the faith of (Britain's King George) imperial pledges which were not redeemed and who, after a life of toil, had passed the bourne whence no traveller returns, leaving an inheritance of difficulty and trouble to their sons and daughters. Duncan Campbell's History of P.E.I. 1875 pg. 141-146. 1770 .......was fairly early, it was not like the mass emigration that took place later, so in an attempt to locate further information on the Falmouth and it's passengers, a check of the Montgomery papers shows no mention of ship's passengers. However, GD293/2/79/5 is an unsigned and undated account of a man's arrival 5 June 1770 with numerous family and no food apart from oatmeal and no house to shelter in. There were 40 or 50 servants who expected better provisions than oatmeal. Then a ship had arrived from Three Rivers with beef and pork. Montgomery then refers to 1774 as being the last year of the indentured servants and they expected to be paid, but this was apparently going to prove difficult. (There is lots more about the difficulties encountered getting settled - mice eating crops etc. It is possibly written by David Higgins and would be interesting reading. ) GD293/2/79/52 was a List of leases granted by David Higgins, May 1775 among whom was Duncan McEwan who had been granted 150 acres on 7 September 1773 - #1/17/6d (presumably annual rent). Reverend William Drummond was the spiritual leader of the Presbyterian group, who begun his journey from Cowden, Scotland several days prior to the Falmouth's sail departure and who kept a daily diary, later referred to as Reverend Drummond's Journal, in which he recorded a journal of his experiences on both the voyage and his first eleven months on PEI. Donald Whyte, in two books on Scottish Emigrants to Canada, says Rev. Drummond was from the parish of Madderty in Perthshire. He lists for whom he has a definite parish of origin, John Miller was from the parish of Muthill, as was Duncan McEwan. William Robbins was from the parish of Crieff and David Lawson from the parish of Callendar. Then, William Dewar, Alexr McNab and Ebenezer Taylor are listed as from Perthshire, Laurence Brown and D McCallum were probably from Perthshire. Robert Auld was from Ayrshire and John Jameson possibly from there. If you look at a parish map of Perthshire, you will find that Madderty, Crieff and Muthill are next to each other, while Callendar is about 13 miles to the west of these parishes. As far as Rev. Drummond, the Presbytery Minutes records when he had been a student of divinity, a probationer and when he had been licensed to preach. The relevant Presbytery was that of Auchterarder and the Minutes covered the period leading up to and including April 1770 (CH2/619/2). In 1761, he was a probationer and was described as Preacher of the Gospel at Wester Cowdan. In October of that year, he had to appear before the Presbytery having been accused of fornication, lasciviousness, obscene discourse, rioting, frequenting ale houses, sitting up with improper company late at night and so on. Then followed several years in which he was investigated and many many witnesses were called to give evidence against him, among whom were several McLarens! The most interesting part was that his father and brothers were named. His father was Donald Gallach alias Drummond aged 60 or over and he had three sons, the Rev William, Duncan and David and they lived at Wester Cowdan where the Rev. William was a preacher. The upshot of it all was that he refused to admit any guilt and on the 6 October 1766 asked for an extract of his license and testimonials, but on the 21 October when he went to collect them, he refused to accept them, as he said that they had been made out differently to the usual form. On the 6 March 1770 (I quote) 'Mr William Drummond Preacher of the Gospel compeared and craved that the Presbytery would grant him ordination in regard he is under Engagement to go abroad as a minister of the Gospel upon condition of his being ordained by the beginning of April next. The Presbytery agreed to grant the above request provided Mr Drummond produce satisfying attestations of his good Behaviour during the time he has resided without the Bounds of the Presbytery, and likewise an authentic Evidence of his being engaged as above represented'. God willing, we may some day unlock the mystery between my great-great-grandfather, William MacLaren, Senior d.1864/65 of Lot 40 Greenwich and the Scottish immigrant Duncan MacLaren. If I could afford an investigative reporter in Scotland who was familiar with the famous 50 year lawsuit, we might finally solve the mystery, meanwhile we'll try to put the puzzle together piece by piece. William MacLaren Sr. appears to have owned a very decent amount of acreage in Lot 40 Greenwich and judging by the l836 survey map, he must have been a land owner by l8l8 when named a Fence Viewer. Although many researchers might think this is a minor post, it was not so minor in the eyes of those who came under the jurisdiction of the Fence Viewer in times when property lines were seldom nice neat little blocks of land. People might be a little careless about births, marriages and deaths but they never were careless about their land records. Our William Senior was not the William b. 1778 d. 1850, who was son of the Brudenell James MacLaren. Comparison shows two different individuals, with two completely different sets of children's names. We are confident that our Greenwich line, William MacLaren Sr. and his wife were born on PEI. His sons John, William Jr., Duncan and David all said consistently on the l88l and l89l census that their mother and father were born on PEI. It seems unlikely that four sons would be so consistent in their report to census takers in two separate reports, ten years apart, for each household would have been tabulated separately most likely. In other words, it's doubtful that all four brothers were gathered together when the tabulator arrived on their doorsteps so there'd be little opportunity to have a consensus vote about where their parents were born. Our William Sr. and his wife, were not buried at Midgell Cemetery, but there's speculation by Vernon MacLaren, the researcher who wrote the earlier MacLaren's of Cablehead, that they were buried at the location of the old Scots Kirk in Morell, possibly the same area as the St. Peters Harbor Cemetery, Lot 39. Vernon marked an 1836 survey map, showing the Scots Kirk (church) that William Sr. may have attended. The Scots Kirk long vanished now, was located near 130 acres of glebe land. Today the St. Peter's Harbor Cemetery has only three stones remaining in that cemetery, apparently there were other burials there, but markers were probably of Island sandstone and have not survived. It is my understanding that a number of years ago the cemetery was pretty well overgrown, and some local people decided to clean it up. The cemetery was plowed up and the field stones markers were plowed under! Another researcher Les Cameron, visited there about 25-30 years ago and found a still legible flat sandstone marker used to constuct the masonry ends of the culvert under the driveway to the cemetery. Can you imagine this last indignity! It's sad that William MacLaren Senior's and his wife's burial plots may never be definitely located, fortunately their existence is readily established by his estate settlement of 1865. Their son, John MacLaren, my g-grandfather, b. 1816 and d. 1888 is buried at Midgell Cemetery but his wife's name, Charlotte Morrow, doesn't appear on the cemetery transcript. "His genial nature and broad sympathy have endeared him to us all. His opinions were those of a candid man who was with us in our love for Christ. He was great enough to measure men by character. We need many more men of such strong Bible faith. Our brother did great sacrifice for the satisfying consciousness of being consistently obedient to God; but men who sacrifice much for the divine command are not generally counting it as a great burden. Could our people more generally hold the Bible in such sacred estimate as the Word of God than we see at this time. I hereby offer my own testimony of praise and gratitude to God for Brother McLearn's helpful sermons." Duncan MacLaren's daughter, Jean MacLaren, married Duncan MACEWEN, in 1771, in Charlottetown. She and Duncan MacEwen settled in Lot 39 and had seven sons and three daughters. She died c.1810 ae. c. 60 and her burial site has never been found. They had a family of seven son's and four daughter's. In 1787 Duncan MacEwen and wife Jean MacLaren relocated to St. Peters where they lived until about 1813. "The earliest record pertaining to his land at St. Peters is a conveyance dated 1 Oct. 1787, for 113.6.0 pounds, of 156 acres in Lot 39 from "George Burns and Mary his wife to Duncan McEwen of Stukely commonly called St. Peter's farmer". It is entered in the first part of the second book of deeds in Charlottetown, pages 126 to 131. There is no date of registration, but it appears in the index as the first entry under the subdivision 'M'E.'. Thus, they lived on the east side of St. Peters Lake/Stuckley Lake in Lot 39; this placed them 6 or 7 miles by sea, and much farther by land from the MacLarens of Greenwich. As "Jean McEwen" she witnessed, in April 1803, an unrecorded transfer of a lease from her son-in-law Kemble Coffin to her son James McEwen. Remarkably some of her children's descendants have surfaced here, hopefully they'll be able to fill in some missing blanks. Visit Rick MacEwen's "Descendant's of Duncan MacEwen"
Andrew B. W. MacEwen�s reconstruction of the passenger list of the 1770 Falmouth voyage assumes Duncan MacLaren and his daughter Jean were aboard. There is no confirmed record of her mother, birth place or birth date. Presumably she was about Duncan McEwen�s age and thus born about 1746. Based upon her child bearing years, of about 1772 to about 1793, she would have been born between about 1748 and 1759. Between 1741 and 1751 there were 6 records of a baptism or christening of a Jean McLaren (or similar sounding names) in all of Scotland. Four were in Perthsire and two were in Edinburgh. Only one of them was to a father named Duncan McLaren. Jean McClaren (sic) was christened in Edinburgh on 28 October 1751 as the daughter of Duncan McClaren (sic) and Jean Armstrong. At best one can only assume this is the same Jean McLaren. Duncan McEwen�s Marriage to Jean McLaren There is no marriage record for Duncan McEwen and Jean McLaren between 1760 and 1770 anywhere in Scotland. Rev. Drummond, in his 1770 journal does not mention a marriage, and as the minister on the ship he would presumably have performed and made note of it. Thus, they were probably married after landing on PEI. Given the birth of her first child about 1772, one can assume she married Duncan MacEwen between 1770 and 1772 on PEI. Jean MacLaren MacEwen, may have had a nephew named David MacLaren who also settled at Lot 40, between 1798 and1810. These lands adjoined those of William MacEwen, and his wife, Elizabeth Patience, was a sister of William MacEwen's wife. A daughter, Elizabeth, of David MacLaren and Elizabeth Patience, was born Aug 1, 1811 and baptised by Reverend Theophilus DesBrisay, Sept 10,1811. (St. Paul's baptismals). Reverend DesBrisay was the first and only Protestant clergyman on the island (Skye Pioneers by Malcolm Alexander MacQueen). It must have been a doubly joyous celebration that late summer's day in 1811, for it was noted, "This baptism occured on the same day that William MacEwen was married by Rev. Desbrisay to Ester Patience." Jean MacLaren MacEwen may have had sisters, or at least cousins or granddaughters! I was in search of a Margaret MacLaren, parentage unknown, no dates, married Angus MCLURE Jr, of Cavendish at Brackley Point. On Sept 4, 1999 new information on Margaret MacLaren has surfaced due to the Rootsweb McClure Mailing List! According to Shane MacClure, shane.macclure@pei.sympatico.ca, these people were his g-g-g-grandparents. He personally visited the gravestone where she and her husband are buried at Cavendish, PEI, thereby confirming the dates. Also, an index found at the P.E.I. Archives reveals she was born in1807, d. 24 March 1892 at North Rustico and her religion was Presbyterian. According to Shane's grandmother's notes and those of another researcher, the couple had 7 children. The parents of Angus Jr. were Angus MacLure and Annabella MacKenzie who emigrated from Inverness-shire, Scotland to Brackley Point, PEI in1794. Shane has additional information on their 10 children. A possible sister to Jean MacLaren, a Mary McLaren, married William Beairsto April 29 1804, in West River, PEI, (Hyde History, Register) where Mary was born at least twenty years earlier. Mary's name is also not found in the Brudenell records, therefore her very early existence may be a clue that Duncan MacLaren and his wife had other children. Another coincidence is that Jemima MacLaine, the photographer of the 1930 North Lake pictures, also married a Beairsto gentleman. "THE MYSTERY OF JOHN MACLAREN"
Yes, once again another strange tale, this surrounding John MacLaren and his wife who have been forgotten and unconnected to either MacLaren line on PEI for years now. Their gravestone lies toppled over in the The Old Protestant Cemetery and fortunately it's wording is still in great shape. Now, buried beside John MacLaren and his wife's plot is a man named Isaac Newton of Dorcetshire, England who died December 28, 1843 at age 60! Colin's eldest son, also named John, later called Lord Dreghorn, was born in 1734, an author of repute, and a senator of the college of justice in the colleges of Aberdeen and Edinburgh. Lord Dreghorn's father and uncle were both Presbyterian ministers. John MacLaurin, Lord Dreghorn, claimed the CHIEFSHIP OF THE MACLAURINS, as the Tiree Branch and arms granted him differed slightly from those adhered to by the Strathearn Branch. John (Lord Dreghorn) died in 1796 but his elder son Colin, named after his grandfather Colin, failed to matriculate for himself the Arms which had been granted to his father in 1781. This brings us to John MacLaren born in 1776 and buried in the Old Charlottetown Burying Ground! Could he be the missing link in that old dormant family line for LDS records remarkably show a John McLaren christened Feb 11, 1776 at Balquihidder, Perth, Scotland to a Colin and Margaret MacLaren? That raises the incredibly intriguing question, are we the lost Tiree Branch of Clan MacLaren? My grandfather, Robert Douglas MacLaren was the eldest son of John MacLaren of Greenwich. Rob, as he was called by Mariah, was kind and respectful to both man and animal alike, being relied on by folks in the North Lake area much like a veterinarian would be today. Besides working his own farm, it wasn't unusual to be out on a cold winter night to deliver a problem sterk, a twisted foal or baby calf for a nickel or nothing. He had a deep and special reverance for God's creations yet believed there were many heathens in the world that poised as pious churchgoers, yet could deliberately abuse a helpless and bokky horse. Though never discouraging Mariah or the children from attending the South Lake Baptist Church he never attended church regularly, rather chosing to quietly read his bible alone on the front bench. He was strong yet humble, quiet and unpretentious and set an example for his family. Here's a wonderful old picture of my grandparents, Robert Douglas and Mariah sitting in front of our old home. It is a mystery why Robert Douglas, his twin brother Crawford and their brother Nathan left Greenwich and never went back or spoke of their connections to it. There must have been a hurt or saddness connected to the history. It's hard to imagine going all those years without telling members of his two families and 16 children about roots back to that area. I only learned myself in 1994 of our connection through my g-grandfather John MacLaren to our Morrow neighbors in North Lake and that his wife, Charlotte Morrow was my g-grandmother. I stumbled into some old bitterness when I visited Cablehead in 1994. I knocked on the door of a home while searching for MacLaren connections, introducing myself as the grandson of Robert Douglas MacLaren of North Lake and immediately, although I'd never met the person before, told abruptly I wouldn't like it there, "we're the Catholic MacLarens"! Surprised and dumbfounded by her surliness, from somewhere within I replied, "Well, maybe I'm Old MacLaren, returning with my feet untied. Her expression told me she knew what I was referring to! You see, many years earlier an old letter called the "History of Cablehead" page 2 page 3 page 4 page 5 page 6 was written by a catholic gentleman which sarcasticly mentioned the passing of "Old MacLaren" and that his spirit was seen returning on the road to Greenwich, with his feet tied! Coincidently, my grandfather died of gangrene of his foot in 1939, so I couldn't help feel the remark was disrespectful and inconsiderate to our immediate family members. I've been told since, the parties involved probably died before my grandfather and couldn't have be responsible. If it's true in my grandfather's case, I stand corrected, yet it was a slur to one of our North Lake MacLarens! When I read the letter in the Charlottetown archives it sent a shiver down my spine, it touched on an ugly side of Island history many people today don't imagine happened, religious bigotry. It's called liberal and conservative today and judging by the lady's cool reception and the sarcastic e-mails when I simply suggested keeping of the name "The Old Protestant Cemetery" it's still alive. There doesn't seem to be a Cablehead MacLaren family history written without major attention paid to how the 'first catholic MacLaren' came about, something even they admit, culminated out of bitterness and plain spite of one young man who later reconciled with his father, even reverting back to the faith of his father. The history of the area though does include errie and outrageous stories about digging up of the deceased and reburying them eleswhere when families argued over religious differences, even to the recent abomination of plowing under of protestant gravestones and using legible stones as bridge supports! Even a beloved catholic MacLaren cousin today, oblivious to his own father's beliefs, easily reels off the story about ground under the foundation of an old east point holy roller church where it's claimed the grass will never grow! Now matter how innocent it is, it's actually another old tale made to insult Protestants in that area. Perhaps Robert Douglas and his brothers were indeed justified for not telling family members of their roots in Greenwich/Cablehead for it seems our history and roots, not to mention the grass, would have a hard time continuing to grow in that area today! I'm sure this was not the way William Senior intended it to be, for in William Sr's estate settlement you catch a couple of glimpse's of the importance of the Presbyterian Church to the family's way of life. The division of his estate held true to the inheritance or birthright rules as would the firstborn son in Old Testament times where birthright is defined as a right, possession, or privilege that is one's due by birth or and a special privilege accorded a firstborn. In conforming to the rule (Deut.21:17) a double portion of William Sr's property went to the oldest son, John, my g-grandfather who in those days would have been assumed to be held responsible for the extra care of his mother and unmarried sisters. Secondly, the estate papers demonstrate the tradition of church pews remaining for the use of the family. However, it cannot be determined whether they were seats in the Old Greenwich Presbyterian Church, the Midgell Presbyterian Church or the old Scots Kirk, however an informative article in the Midgell Cemetery transcript reads, "Presbyterians at nearby Greenwich also joined the Union and had a church of their own from 1834 to1960, after which they worshipped at St. Peter's Union Church". It's hard to believe but they say the Old Greenwich Presbyterian Church located on the Cablehead Rd just below Leslie's Grist Mill, is still standing though boarded up since 1960. I'd be curious to find if the church pews were still there or if we're missing a cemetery that possibly surrounded the Old Greenwich Presbyterian Church, since there's so many missing burial sites in the area. Perhaps one day someone might use technology to see if there are buried stones in the old cemeteries, imagine, there may still be legible stones! Here you'll find tidbits told by my mother, Violet Pearl MacLaren/MacLaine. She was born in the old family farm at North Lake in 1916, across from the old school. Violet is the youngest and last surviving child of 10 children. Relax and read about a time so much different, but really not all that long ago. Cindy, my beautiful daughter, there's a fascinating and historically rich background on your great-grandmother, Mariah MacLaine MacLaren (1873-1945). Mariah was born and raised in the Old Rocky Point Lighthouse, where her father Archibald MacLaine was the lighthouse keeper. This old lighthouse, called the 'Blockhouse' because of it's unique shape, still stands majestically at the mouth of Charlottetown Harbor. Archibald was head of this senior cadet line and I believe Violet is his last surviving grandchild. On June 27, 1894, Mariah married my grandfather Robert Douglas MacLaren, 1853-1939 of Greenwich, PEI. 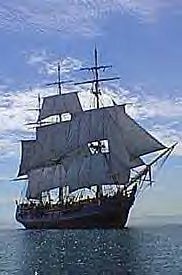 Her brother's, all long gone now, were ship builders and sea captains on old square riggers that once sailed the seven sea's. Back in1954, when I was 10 years old and visiting the old 'Blockhouse', I remember feeling a bit mischievious so I carved my initials on the stairwell leading to the top of the lighthouse, wonder if they're still there? 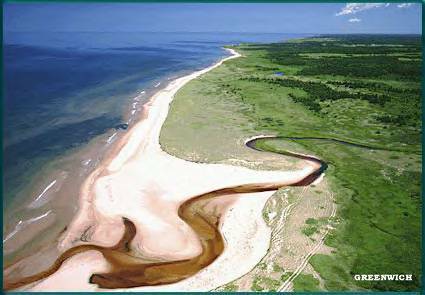 Speaking about lighthouses, your never far from lighthouses and the ocean, in fact only sand dunes seperated our old home at North Lake from the Gulf of St. Lawrence. It was only a few miles from the East Point Lighthouse thats where I have a grand picture of you Cindy, Mom, Vinny, Jason, standing in front of. 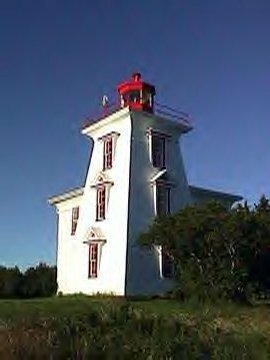 There's more information on lighthouses atA Brief History of Canadian Lighthouses. When she was a little girl, Violet's big adventure each summer was visiting her MacLaine cousins. Her father would bring her and her mother to the Elmira Railroad Station where they'd climb aboard the old train for the trip to Charlottetown. Can you imagine Cindy, I have pictures of you kids standing on that same old train your grandmother rode on way back then! Her uncle, John MacLaine, Captain of the Harland, would meet them at the Charlottetown station and bring them to her mom's sister, Aunt May (Peardon). All the formality was probably a bit boring for Violet though, being the tomboy she was. She couldn't wait till it was time to jump into Captain John's horse carriage for the ride to Rice Point where there was certain to be fun times with her cousins at the old MacLaine homestead. Robert Louis Stevenson wrote a short poem about the excitement of a small child as they go on a railway journey, I believe it describes perfectly how she might have felt! The MacLaine Clan found this website by chance. Their Lochbuie Chief, Lorne MacLaine of South Africa, says we are directly related and according to him we will be referred to in the clan as THE MACLAINE OF KILMORY or at least until proven otherwise. Of course it's not official, I'm sure there will be more on it in the future! If I say so myself, our remarkably detailed pedigree, called the MACLAINE OF KILMORY (SCARBA) Cadet of Lochbuie, dated 18th February 1972, was compiled from the diagrammatic lineage of the family of MACLAINE'S in P.E.I. prepared by the late Mr. Rankin MacLaine of the Island. There's also two MacLaine Homepages, one at MacLaine Clan, the second at Clan Maclaine Of Lochbuie Homepage. Here are interesting and fascinating links to other MacLaine sites, enjoy. Another old book "A history of the clan Mac Lean from its first settlement at Duard Castle, in Mull" makes for good reading on a rainy day all cozy by the fireplace. MILLIONS DECEIVED THROUGHOUT THE AGES! I've always wondered what truly divides Scots and Irish besides religious differences, in spite of the fact they're of common descent and one single cultural unit? I can't be the only one who has wondered about our kinsmen being led by the catholic Prince at Culloden; were they fighting for a religious cause. Had historian's missed the mark on mind sets and motivating factor's of those times? Were Scotsmen, in the heat of the hour and fearful their nation would be swallowed up by the powerful English neighbors, simply trying to save their national identity over which much blood was spilt over the centuries? Many MacLaren, besides fighting against assimilation of their way of life, may have spiritually hoped to rekindle a spark of the ancient, non-romanized version of the Druidic Celtic Religion that they were a part of! In early days, and perhaps until the nineteenth century, twice a year on 1 May and 1 November (Beltane and Samhain) a fire was lit on Tom nan Aingeal, all other fires in the village were put out and the folk came up here to receive new fire for rekindling their hearths. and fighting spirit, and these traits are all aptly reflected in the Gaelic psyche. Gaeldom in the seventeenth and eighteenth centuries. than is his nominal connection with Greece and Rome, or even Palestine." The Roman Church gave Law, the Celtic Church gave Love." Historians distorted the truth for centuries about the origins of the Celtic Church and the abbey system by saying it generated from the Roman Church. The Celtic Church was in fact an outgrowth of that of Egypt, not Rome, and it's position in Europe PREDATED the Roman Church, it's as simple as that? Celtic belief in family, with emphasize on the female line plus nature and a single God is distorted today by tales of druidic sacrifices and witchcraft. The astonishing and simple truth is, many people with Gaelic Celtic roots have forgotten their ancestor's beliefs in nature and a single God and instead are worshipping the pagan Conqueror Church! Unfortunately even today, many Scotsmen and Irishmen fail to learn or acknowledge the truth found in history that would unite them. Our MacLaren Clan, at one time, held high station and respect, perhaps as being on an equal basis to the central King who may have felt threatened or even jealous. The MacLaren Clan, representing the ANCIENT ONES of the Cruithe, were something therefore to be reckoned with, in less subtle words, destroyed. The clan motto, Faithful From The Beginning errily reflects the reason for the near demise of this clan, for it was torn between religion and politics of the bureaucracy and almost completely eliminated. The Celtic Church as a whole began to lose power as early as the twelfth century. An aggressive Anglo-Norman presence meant that Celtic custom was assailed at the official level, both royal and ecclesiastical. This meant that the privileges of the original Celtic earls were also threatened. The most important of these Celtic earls were the Earls of Strathern, who were descended from the original dynasts of Strathern (earl translated the earlier Picto-Gaelic title of mormaer, or great steward, the rank held by dynasts or sub-kings under the Pictish and later Picto-Gaelic high kingship). As earl of what had been the Pictish province of Fortriu (genitive Fortrenn), the Earl of Strathearn had the most clearly Pictish credentials of any of the royalty in Scotland. Together with the Earls of Fife, who originally alternated the kingship of Albany with their cousins of royal house, these Earls of Strathern had a long tradition of being, with the Earls of Fife, peers of the kings of Albany and later of the kings of Scots, in the original sense of the word, that of equal. In fact, they were paramount among the seven original Pictish earldoms or sub-kingdoms (Atholl, Angus, Mar, Moray, Caithness, Strathern anf Fife) from Pictish times, whose dynasts were known as The Seven Earls of Scotland, and who, as late as 1290, still asserted the right to the power of king-making, as peers, or equals, of the King, as per Celtic custom, thus we have the significance of their direct Pictish links. As Earls of Strathern, they held sway over a territory in the center of the kingdom which included Scone, the inauguration site of the medieval Scottish kings and of their Pictish predecessors. The Celtic line continued as earls until the destruction of their local sovereignty in1344. However, by that time Malise, eighth Earl of Strathern, was also the Viking Earl of Caithness and Orkney by inheritance, and he continued in his northern holdings unopposed until his death. He was all the more a target for royal jealousy because Orkney was still held under the Norwegian king. Close family links had been established between Malise and the Celtic Earl of Ross, and this probably contributed to the forfeiture of the Scottish holdings of both earls in the latter half of the fourteenth century. The Celtic Earls of Strathern had fostered a clan in the highland part of their territory: they were descended from Laurence, Abbot of Achtow in Balquhidder, himself a younger son of the House of Strathern. This kindred held allodial rights to their lands as kinfolk of the earl, and came to be known as the Clan Laren, or MacLarens. The Earldom of Strathern was vested in the Crown by David II, who made his nephew Robert the Stewart, Earl of Strathern in1357. After his accession to the throne as Robert II, Robert gave the earldom to his son David, later it passed to Walter Stewart, Earl of Atholl (during the same period the insecure and acquisitive Stewarts enhanced their direct power and control over Scotland by deviously obtaining control of all the most important Scottish Earldoms). It all took place many years ago, not that much different though from powerful political, religious games that continue today to control our lives behind the scenes. If you have but a touch of MacLaren blood, your life and destiny might reflect our ancestors naivety, unselfishness and faithfulness to others, so if you find yourself putting other's beliefs and convictions in front of yours, be careful, you may be carrying on those destructive traits! The old MacLaren traits of fierce independence and humble persona, along with their strong beliefs and stubborn convictions aren't always understood or appreciated by others in these irrational times. Certainly, when it comes down to integrity, honesty, truthfulness and trust, the world would certainly be a better place to dwell if these sort of values were still honored and revered. If danger ever reaches us, it must spring up amongst us. we must ourselves be it's author and finisher. AUTHOR AND NOT THOSE OF COMPUSERVE CORPORATION. "WIN" in Court .... with or without a Lawyer!